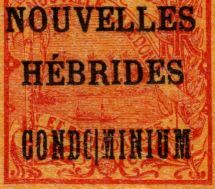 The first French overprints of 1908 lacked the word Condominium and the British kicked up a fuss, so in 1910 they were additionally overprinted with the word Condominium. Varieties of these typeset overprints exist (extra spacer type or missing spacer type), and I enjoy looking for them at stamp shows. 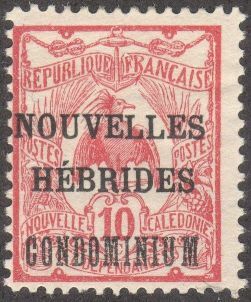 I picked this 10c stamp up at the PIPEX 2014 show. 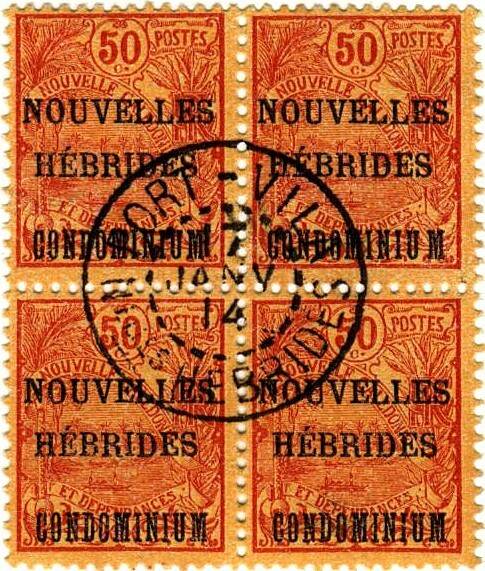 It has an extra space between the U and the M. Here is the same variety on a block of 4 of the 50c (top right stamp).